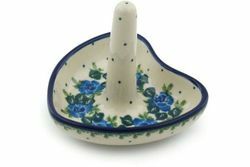 Polish Pottery Ring Holder - this stoneware ring holder is the perfect addition for your vanity. A beautiful display for your rings! Made in Poland, Boleslawiec pottery is painted by hand by talented artisans at famous Ceramika Artystyczna factory, so no two pieces are identical.